A decade after Mamma Mia! 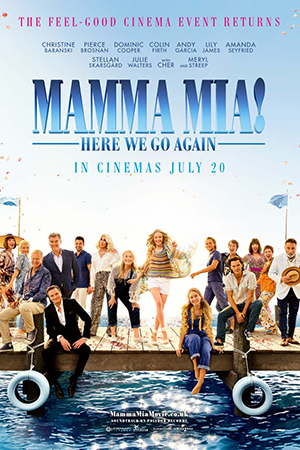 The Movie, we’re heading back to the Greek island of Kalokairi for another joyful and infectious musical based on the songs of ABBA. Ten years on from the events of the first movie, Sophie (Seyfried) is pregnant and wants to learn more about her mother’s past. The film begins to flit between past and present as Sophie learns the trials Donna (Streep) went through before she was born, and how those experiences could solve her own worries. Lily James (Baby Driver, Darkest Hour) joins the fun under the sun to play Donna’s younger self, while Jeremy Irvine, Hugh Skinner and Josh Dylan feature as young Sam, Harry and Bill respectively.